Shortly after the defeat of General Braddock ( covered elsewhere) the frontier potions of Pennsylvania erupted with murder, mayhem revenge and wholesale slaughter. Bolstered by defeating the invincible Braddock expedition, the french and their Indian allies struck across the state. The state goverment tried to place troops at choke-points and strongholds with varying degrees of success. Fort Granville was captured and burnt ( covered elsewhere) Fort Pomfret Castle was abandoned while still in construction. Other forts became too exposed and were also abandoned. This lead to many of the frontier settlements and settlers to become exposed to the raids. Once Such example of this was Draper's Meadow massacre, on July 8th 1755. In Central PA an event that came to known as the Penn Creek Massacre was perpetrated. Penns creek meanders across a large stretch of central Pa. It meets the mighty Susquehanna near the town of Selinsgrove. Near where rt 522 intersects rt 11/15 there are memorials to a group of people who were caught up in the clash of empires. The year was 1755. The month was October. The relations between the little settlement along the creek and the Indians at Shamokin ( now Sunbury) had lived in peaceful coexistence up till this point. A group of Delaware raiders from the town of Kittannaning arrived at this little settlement on October 16th. Their arrival ended the peaceful state of affairs in the area. The entire population was killed or carried off, one person was wounded and managed to escape and alert the countryside. 14 people were slain and scalped, 11 were taken into captivity. Others in the area came upon the site and reported " We found thirteen, who are men and elderly women, and one child, two weeks old, the rest being young women and children, we supposed to be carried away. The house, (where we suppose they finish their murder) we found burned up, the man of it, named Jacob King, a Swisser, laying just by it. He lay on his back, barbarously burned, and two tomahawks sticking out of his forehead; one of them newly marked W.D." John Harris who founded Harris' Ferry ( future Harrisburg) took a party of 40 men upriver to investigate the situation and find out the intentions of the Indians at Sunbury. 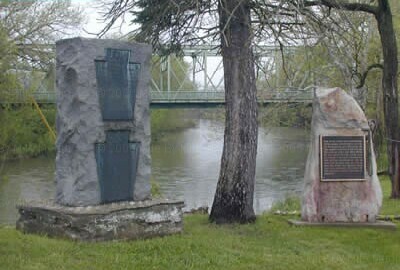 They stopped at the site of the massacre. After they ensured all was done for the remains they moved upriver to Sunbury. Before arriving at the Indian Village, something warned them the town was no longer friendly. However north of the Massacre site, they were ambushed by a large part of Indian warriors. Seven of his men were killed, and five one drowned during the withdraw. The prisoners of the raid were most likely taken back to the village of Kittannaning where the famous Delaware War leaders . This group also was responseable for the Le Roy Massacre new New Berlin. Of the survivors of the massacre two girls were taken who would later be freed in a counter raid. Marie le Roy and Barbara Leningerwere both 12 when they were captured. They wrote of the experience later after they were freed and returned to the colonies. “Early in the morning of the 16th of October, 1755, while le Roy’s [the father of Marie] hired man went out to fetch the cows, we heard the Indians shooting six times. Soon after, eight of them came to the house, and killed Barbara (Marie) leRoy’s father with tomahawks. Her brother defended himself desperately for a time, but was at last overpowered. The Indians did not kill him, but took him prisoner, together with Marie le Roy and a little girl who was staying with the family. Thereupon they plundered the homestead, and set it on fire. Into this fire they laid the body of the murdered father, feet foremost, until it was half consumed. The upper half was lying on the ground, with the two tomahawks with which they had killed him, sticking in his head. Then they kindled the fire, not far from the house. While sitting around it, a neighbor of le Roy, named Bastian, happened to pass by on horseback. He was immediately shot down and scalped. Two of the Indians now went to the house of Barbara Leininger, where they found her father, her brother, and her sister Regina. Her mother had gone to the mill. They demanded rum, but there was none in the house. They then called for tobacco, which was given them. Having filled and smoked a pipe, they said: “We are Alleghany Indians and your enemies. You must all die!” Thereupon they shot the father, tomahawked her brother, who was twenty years of age, took Barbara and her sister Regina prisoners, and conveyed them into the forest for about a mile. Soon they were joined by other Indians, with Marie le Roy and the little girl. Thus the murdered settlers passed into the annals of history. However as often happens in places of tragic death and violence, some did not pass quietly into that good night. In the early 1960s a family had just moved into a house near the le Roy Massacre. It did not take long for the family to notice that something was not right in the house. The very day that they moved in, three family members were alone in the house in an upstairs bedroom of the house. They began to hear a loud sound as if the house itself was breathing heavily. Then ominously they heard something coming up the stairs, as if a being of great weight was slowly and methodically climbing up. The heavy footsteps became louder and heavier as something approached the second floor. The three family members thought that someone must have broken into the house and in a panic they moved a heavy wooden antique dresser in front of the door to block the intruders entrance into the bedroom. Even with the massive dresser blocking the way the door flew open with considerable force revealing… NOTHING. A mother was delivering lunch to her son while he worked in a car junkyard. When she arrived, she was a a gruesome torso of a man dressed in ancient garb who was drenched in blood. The apparition seemed to float in mid air. The long dead blood dripped from wounds that had faded into the past ages ago, and it oozed into a soil that had long since reclaimed its vital nutrients. As the Lady woman ran from the apparition, it soon faded. Like many sites there is a local legend that if you turn your headlights off while crossing the bridge you will be confronted with a host of apparitions. This might be considered the stuff of urban legends that meets the rural crossroads unless you know the history of the restless spirits of the Penn’s Creek Massacre. Disfigured and dismembered apparitions are seen at the sites of the massacres. Poltergeist activity has been reported. The terrified screams of the victims are sometimes heard. A strange impish creature with red eyes is even reported to have been seen haunting the area.